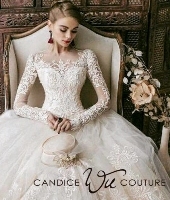 Candice Wu is a Boston-based, award winning wedding dress designer. Her work has been featured in upscale national print magazine and broadcast media including Vogue Magazine, Marie Claire Magazine, and Fashion TV. All her stylish, high-quality, and reasonably priced dresses are made-to-order in the USA. Made-to-measure (custom sizing) and design modifications are available. Many designs are convertible and functional and adorned with beading and Swarovski crystal accents that are intricately applied using an exclusive technique. Store located in Boston's historic South End. Be sure to see our fashion shows at Rosecliff: 12:00 noon and 2:30 pm. Same showcase of Bridal Fashions - 2 chances to enjoy! 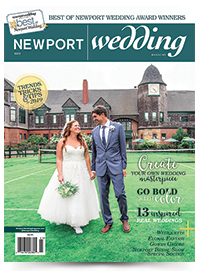 And please look for information about Candice Wu Couture in your free Welcome Bag at the 17th Annual Newport Bridal Show, Sunday, March 3, 2019. Complete the form below to send Candice Wu Couture an e-mail message.